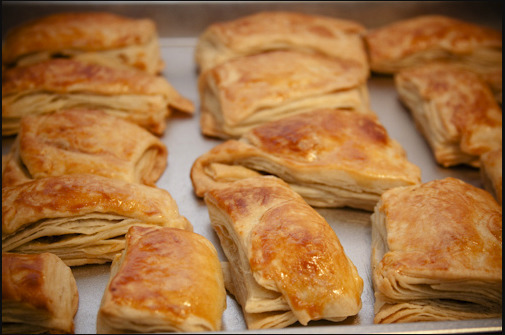 Pate is a tasty pastry that is very popular in Haiti. Typical fillings include beef, codfish, or chicken. Combine salt water and flour in a large bowl. Mix well using your hands. Generously dust surface area. Knead until dough is firm and slightly sticky. Roll the pastry into a ball. Pack it up in a plastic wrap. Set aside for 15 minutes. Over medium heat, heat oil in a skillet or saucepan. Add onions, garlic, shallot, peppers and seasoning mixture. Stir-fry for 1 minute until softened. Add the meat and simmer with water until meat is tender and water is absorbed. Add tomato paste and stir well until medium brown. On a clean surface area, dust with flour generously to prevent dough from sticking. Using a rolling pin, flatten the dough and stretch in a rectangular circle. Roll dough front to back and back to front until 1/8 inch thick. Spread the lard or shortening mix generously. Fold in the flaps to cover over coated areas. Sprinkle the dough with flour and roll out evenly. Form into a ball and set aside for 15 minutes. Repeat the steps to flatten and fold the dough. Wrap the dough ball in plastic and let refrigerate overnight. Preheat oven at 375° and prepare to bring out the dough. Unwrap dough and roll out evenly. Divide into disc like shapes. Roll disc dough, as thin as possible. Place disc dough in the palm of your hands and extend pieces with fingers. Add filling. Fold dough and seal edges. Bake until golden brown. Serve warm. To seal, brush the edges with egg wash (1 egg + 1 tbsp of milk, beaten). I simply love Haitian patties simple to make and delicious. thanks! guys. I love this website.